Because they are often overlooked as an architectural building component that requires regular maintenance, window frames and mullions on commercial buildings, due to constant exposure to the elements and environmental pollutants as well as chemicals leaching from adjacent building materials, tend to lose their luster over time. Depending on their surface finish, it is common to encounter degradation such as oxidation and fading, chalking, or chipping of paint on aluminum frames and mullions on commercial buildings. 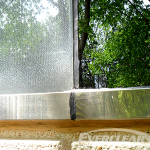 Not only does Everclear Enterprises, Inc. assist our clients in maintaining the aesthetics of the assets they manage by providing routine maintenance of the window frame and mullion system, but in most cases we can also restore frames and mullions to their original condition and apply a protective coating to prevent oxidation or other degradation from occurring in the future.